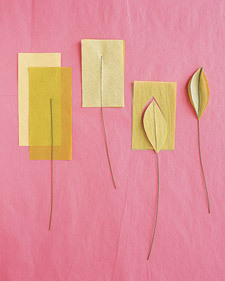 To make three double leaves, stack tissue in three hues of green. Cut 2-by-3-inch rectangles through all layers; fold in half. Trim tips into points; unfold. Twist each sheet at center. Fold 18-inch floral wire in half, slip over center of leaf, and twist. Fold tips toward each other, and curl. Stack tissue in two hues of green. Cut 2-by-3-inch rectangles through both layers. 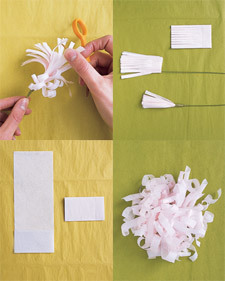 Apply glue along the upper third of a 9-inch piece of floral wire; sandwich between tissue layers. Let dry. Cut a leaf shape. Separate layers of tissue. Cut several 1 3/4-by-2 3/4-inch and 1 1/4-by-2-inch rectangles from tissue paper; fold each in half lengthwise; cut one end to be rounded, and twist other end to shape. 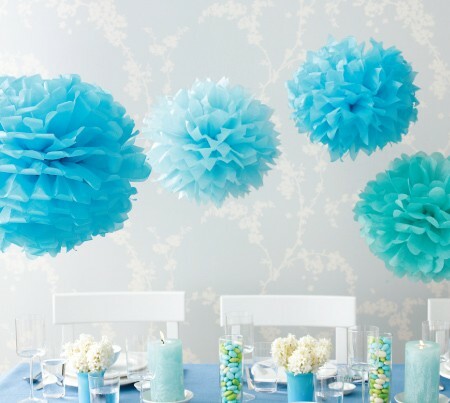 For the center, roll white tissue paper into a tiny ball; cut out a square from white tissue paper, and wrap it around the ball, twisting tissue at its base. Attach the twisted end of the ball to a piece of floral wire by wrapping with green floral tape; add petals one at a time (start with small petals and end with large ones), taping twisted ends onto floral wire. 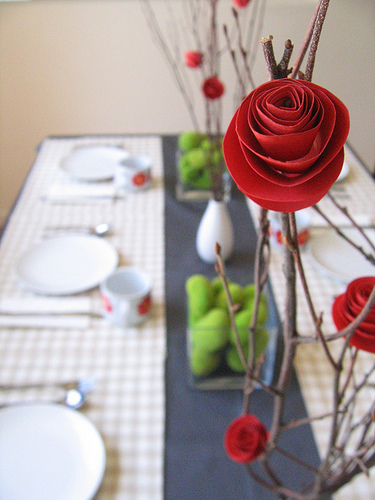 Trim floral tape; spread out petals. Each bloom requires 12 (or six pairs) stamens attached to floral wire with floral tape and five 4-by-2 1/4-inch pieces of tissue paper. 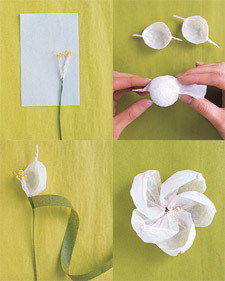 For each petal, wrap tissue halfway around 1 1/2-inch Styrofoam ball, forming a half-sphere; twist ends, and remove ball. 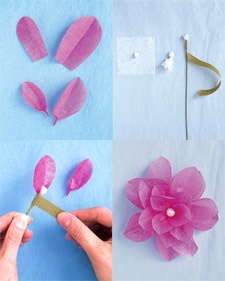 Attach one end of a petal to the base of stamen with floral tape. Add the other petals one at a time. Trim pointy ends. Gently pull petals away from center. 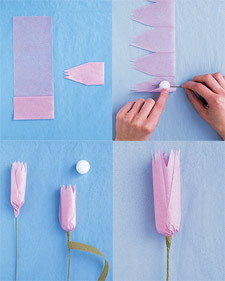 Cut a 16-by-3 1/2-inch strip of tissue paper; make 2-inch accordion folds. Trim and notch one end of tissue through all layers, as shown; unfold. 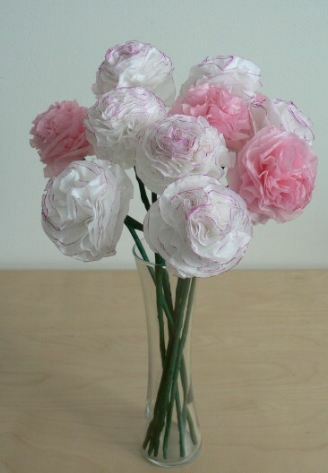 Insert floral wire into a 1-inch Styrofoam ball; place ball near bottom of tissue strip. Roll tissue around ball; twist bottom. Remove the ball with tweezers. Wrap floral tape around the twisted tissue and wire. Trim the floral tape. 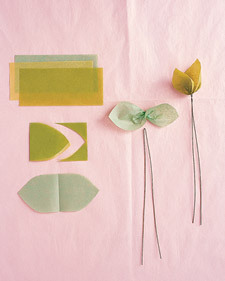 Cut a 16-by-3 1/2-inch strip of tissue paper; make 2-inch-wide accordion folds. Make 3-inch-deep snips in tissue to create fringe. Wrap unfringed end around floral wire. Secure with floral tape. Run scissors blade along pieces of fringe to curl; fluff. ← The 530 Bride Drawing Ends Tomorrow May 6th at 11PM!